IO Interactive has released a second video for its “How to Hitman” series, which is designed to hype up the upcoming Hitman 2. This new entry, titled “Assassin’s Mindset,” teases some of the improved stealth options players will employ while engaging with targets. The creative kills that put Hitman on the map are, of course, returning. In the Hitman 2 video above, we see 47 drop a race car on two mechanics working beneath it. For “Assassin’s Mindset,” the goal is to show off how players can put their targets in such vulnerable positions. One advantage players will have is the minimap. It not only displays 47’s targets and potential threats, the minimap also alerts players when they’re being hunted. If Agent 47’s identity has been compromised, players should expect to receive notice of that as well. Because security cameras can be devastating to a mission’s success, IO Interactive is introducing grids. According to the narrator, these grids “now show you exactly what the cameras see.” Therefore, being mindful of a camera’s field of view is instrumental to passing through an area undetected. Another new addition is Picture-in-Picture. This feature “alerts you to important events as they happen, providing you the crucial context to help you plan your next move.” Picture-in-Picture will come in handy on longer missions, when keeping track of mistakes becomes difficult. In the video, we see that Agent 47 knocked out a guard earlier in the mission. While Agent 47 is engaged in a new activity, a small window pops up in the top left corner and shows another guard finding his colleague’s unconscious body. Sure, the new feature reminds players to hide bodies. Yet, it also serves as a good reference should players wish to either restart the mission are try it from start to finish at a later date. Of late, IO Interactive has revealed several new details about the forthcoming sequel. For one, “How to Hitman’s” first video highlighted the game’s upgraded AI systems. 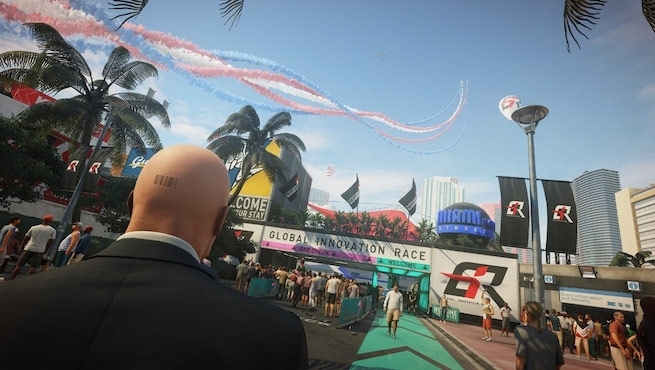 Recently, the studio announced plans to launch the first Hitman’s missions as DLC, updating them to meet Hitman 2’s standards. Those who already own the first game will have access to the DLC for free. Another recent reveal saw IO announce Colombia as a new location for Hitman 2. Hitman 2 launches on the PlayStation 4, PC, and Xbox One on November 13, 2018.